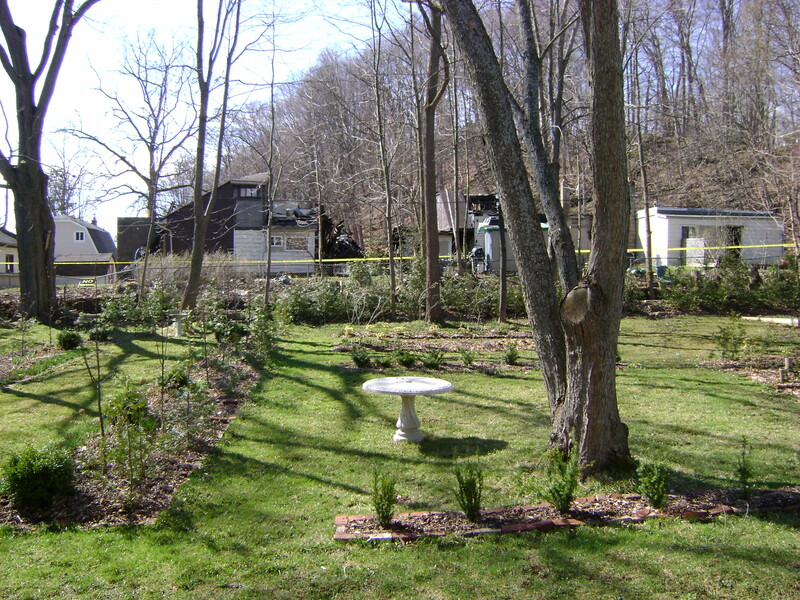 When we purchased Kilbourne Grove in May 2006, it was perfect. Well, not quite perfect, I wanted to change 3/4 of an acre to a formalish garden, and the house needed some renovations inside, but other than that it was perfect. Except for the Deliverance house behinds us. It was an eyesore. What had once been a lovely two century home, had been turned into apartments, and had some very unsightly structures tacked onto the back. See what I mean? So I immediately planted a cedar hedge, hoping that by the time we move in on a permanent basis, it will be somewhat screened from view. Then came Easter Monday, 2010. Ian and I did our usual leaving at 4:00 in the morning, driving back into Toronto so we could get to work for the day. By 8 a.m., the fire engines began to arrive. Luckily not at our house, but the Deliverance house behind us was not so lucky. It burned to the ground. The next 2 summers were very peaceful. And of course my fantasies started. Wouldn’t it be nice if they wanted to sell it? That would double the size of my garden. I started dreaming about all the lovely features that I could add. But when I arrived Sunday night, this is what greeted me. I was surprised they could get it up so fast over the winter, although I should say the winter that never was. So the dreams are dead, and I must get outside and manure my cedar hedge and encourage it to grow. The Deliverance house is no more! 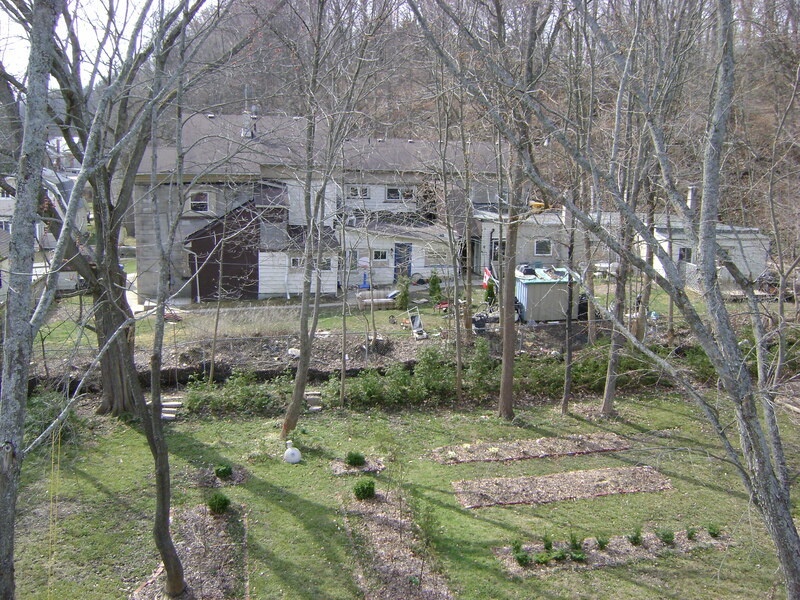 On Sunday, I took the pictures of my garden from the roof. 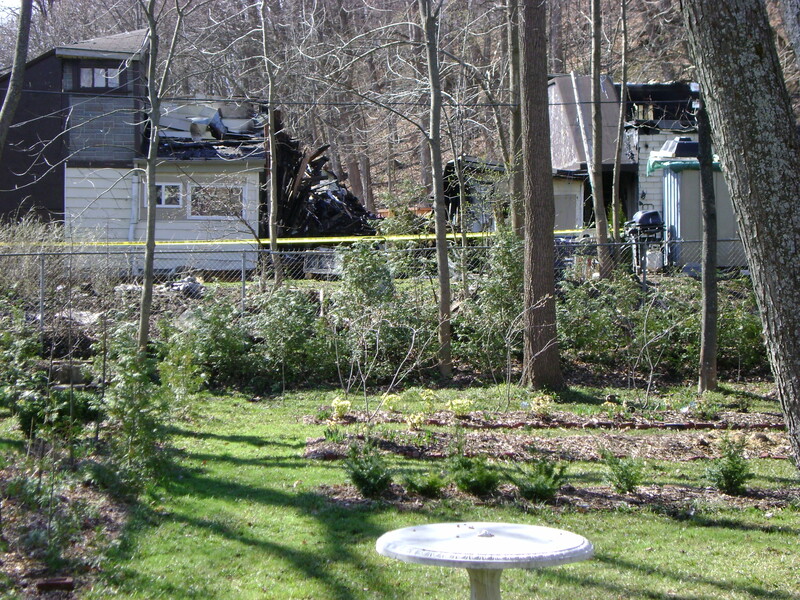 On Monday, our real estate agent e-mailed us and told us the house was on fire. Someone had been careless with a cigarette, and the fire was noticed at 8 a.m. Unfortunately, it burned to the ground. The middle section burned first. 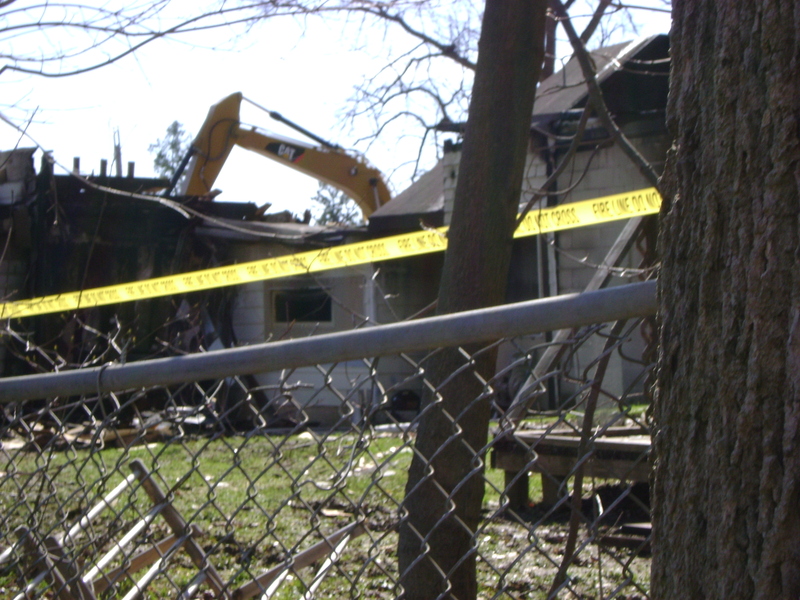 The owners brought in a backhoe to tear down the building. to pull it down, moments….. I do not know what this means for Kilbourne Grove. Ian is upsetting me by saying they might put up an apartment building. At least the Deliverance house was only two stories, in time, when the cedar hedge grows, it will be (mostly) hidden. There is no way to hide an apartment building. Sorry, I took so long to give you the news, I was waiting for my real estate agent to e-mail me some pictures of the destruction. Please, please, indulge me. This might bore regular readers of my blog, afterwards we will return to our regular programing. When I started this blog, it was to tell of our progress and show pictures of the house and garden to family and friends. Ian and I have been transferred a few times, and a lot of our family and friends are not able to visit Kilbourne Grove. So, this is the first post on the inside of the house. When we bought it was a “work in progress”. The old owners, a doctor and his family, had lived there for over 40 years, and it had not been updated. When the doctor died, his wife moved to a nursing home and a developer bought it. They redid the kitchen and the two bathrooms, as well as new roof, new furnace and forced air ducts (taking out the beautiful old rads that Ian and I love so much.) Most of the rest to do is cosmetic. However, we have been so busy on the garden, that we have mostly left it alone. I wanted to get as many trees, hedges, shrubs in as early as possible, so the “bones” will have a chance to put on some growth, before we move in full-time. Our first project has been the library. For most people this would be the living room, but as we have so many books, we call it the library. It is a long room, 25 x 16, with a corner fireplace, a bay window and pocket doors to the front parlour. It also has doors to the front hall, kitchen and butlers pantry as well as another window, so there is not a lot of wall space. The ceilings are 12 feet high. This is the way it was when we purchased it. Here you can see past the corner fireplace (I hate corner fireplaces) to the front parlour. The front parlour was where the doctor saw his patients. There were only two walls where we could build our bookcases. Here we are in the process of putting the furniture back against the wall. Another view, looking east, this time you can see the bookcase we had built behind the chesterfield. Looking west towards the other bookcase. The paint colour really changes with the time of day. It is a true red in the evening with the lamps lit, fading almost into black in the shadows. Sometimes during the day, it ranges from pink, to fuchsia to burgundy. It is quite a chameleon. We spent this weekend moving the rest if the furniture in and hanging some of our art. It is starting to fell like home. Looking east towards the front parlour. There is still changes to come. We need a chandelier over what will be a round pedestal table. The Bay window will hold our desk (which is being used as a dining room table in Toronto at the moment. A large rug to take the place of the sisal. And the floors need refinished. But it is almost the way we want it, yay! One room done, 11 to go….sigh! I thought that I should introduce you to some other parts of my garden. My property is 210 feet x 150 feet. The 210 runs along the street as does the side of the house. Originally the houses front door which faces east, had a large front lawn in front of it with a circular drive for carriages. 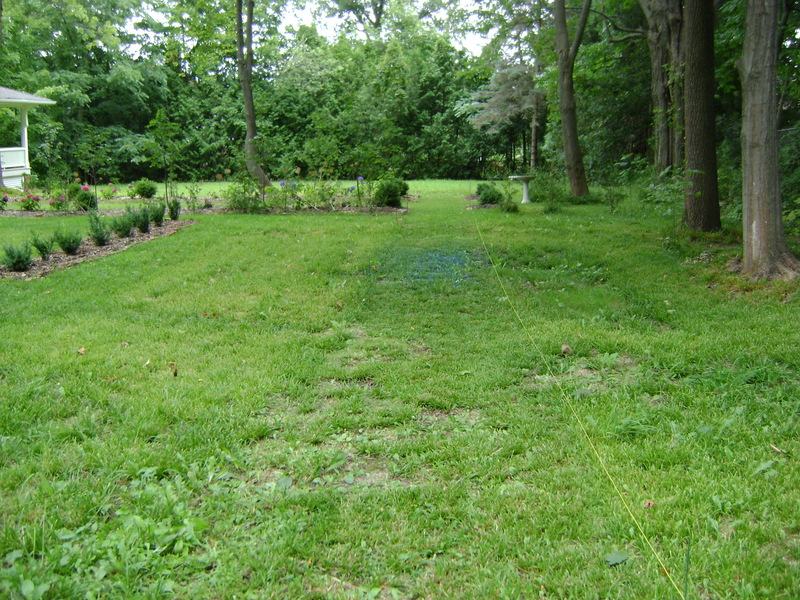 on the north side was a laneway, that led to the stables behind the house. So we had the main part of the house, then a smaller section that contains the butlers pantry, then kitchen (now a mudroom), a back staircase and two small servants bedrooms on the second floor. 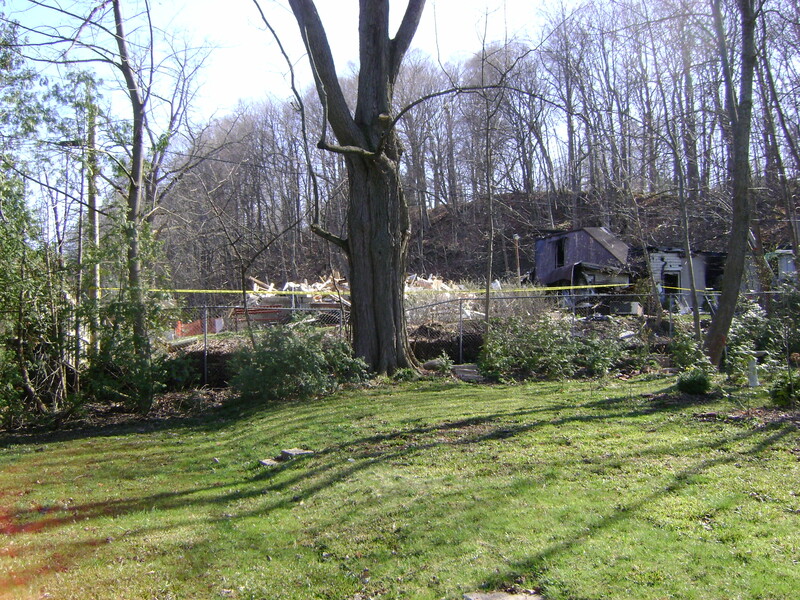 Over the years, like so many other houses, land has been severed off and sold. Unfortunately, the land at the front door has been sold and now the front door faces my next door neighbours. The laneway has become a street and the side of my house faces it. Their is a garage to the west of the house and a drive, which means everyone goes to the back door, which is glass. Not something you want when you are standing there in your knickers. That is something that has to be addressed in the future, but for now, I remain dressed at all times. 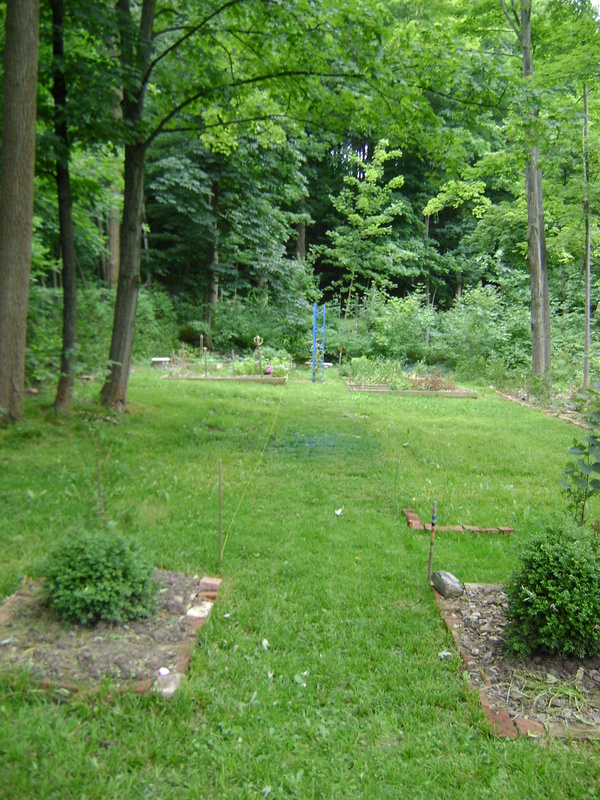 To make a long story short (too late for that now), we started the garden in May 2007 in the south west corner of the property. It is almost directly south of the garage (with another garden between it and the property line, but that is for another post). 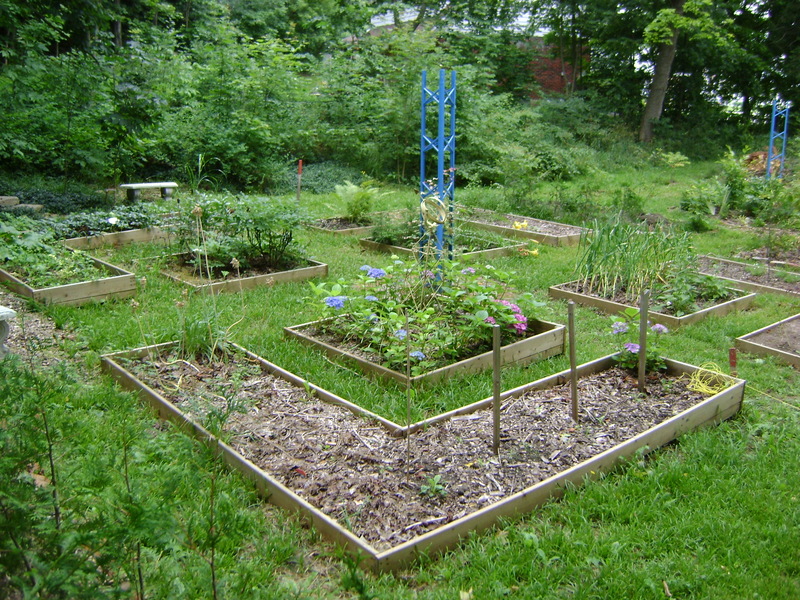 I wanted a raised bed, “kitchen garden” or “potager”. It would be a holding area for all the plants that I would be given (or would weaken and buy). I planned on also using it for veg, herbs and some flowers for cutting. It is a 30 foot square with a 5 foot path running north to south, and east to west in the middle of it. The beds are 3 feet wide and have 2 foot paths between them. In the centre of the beds, I used to have a large glazed urn, it has been replaced by a piece of salvage. You can see that there is 4 L shaped beds around the outside and 4 small square beds inside them. From the centre, you look north to “Flora Glade”. To the south and the west is the berm with cedars planted on it. At the end of these paths, we have placed a cement bench. Looking west, from the Lime Walk towards the Kitchen Garden. I am thinking about an allee (perhaps kind of tunnel like here). 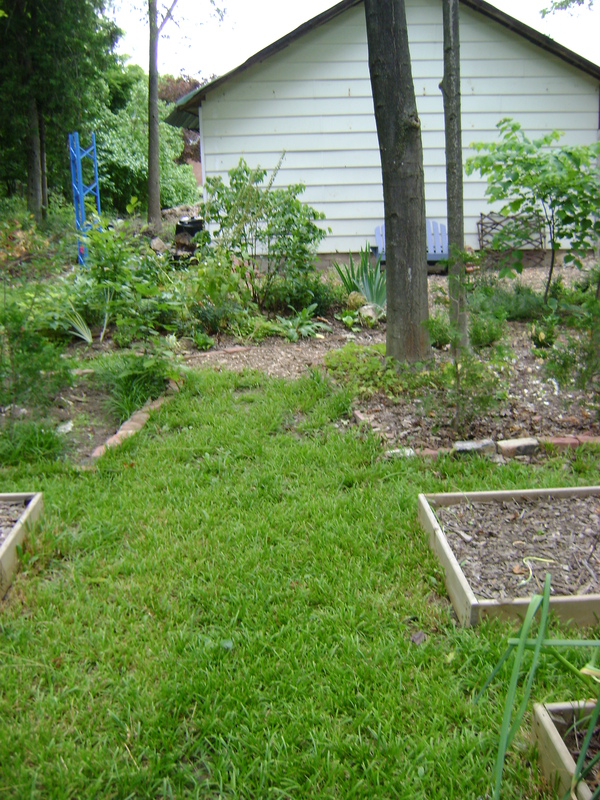 The kitchen garden is almost finished, there is not much to do here. I would like to lift the grass between the beds and replace it with pea gravel. This way, I will be able to walk out at all times of the year without getting muddy. That’s my blog, and I’m sticking to it! I can’t believe I’m so shallow!!! I originally started this blog to save myself some time. My husband and I have been transferred many times with his job, we’ve never lived anywhere long enough to feel like it is our home. When we were transferred back from England, to work in Toronto, we decided to look around and decide where to make our home. We had lived in a 424 sq foot flat in London and were still married, so we decided to buy a palatial 700 sq st flat in downtown Toronto, and look for a weekend/retirement house. Where to buy it was another matter! We had loved living in Kingston, we sailed during the summer and Ian snowboarded in the winter. The problem was that the good snowboarding was in Mount Tremblant and that was a 4 hour drive. A bit much to be driving on a regular basis. So where else could we live? Well it had to be within a 2 1/2 hour drive of Toronto, we decided. It also had to be near the water so we could sail, and near a ski hill. There was only one area that we could think of that had that, so we started looking in Collingwood. Let me tell you, Collingwood has gotten very expensive in the last 10 years (damn those rich Toronto people, driving up the price) and we didn’t look there long. Meandering along the shoreline we looked at all the small towns and then got to Owen Sound. One of my many requirements was a big garden with an historic home. Ian and I have always lived in old houses and just love the character that you get. 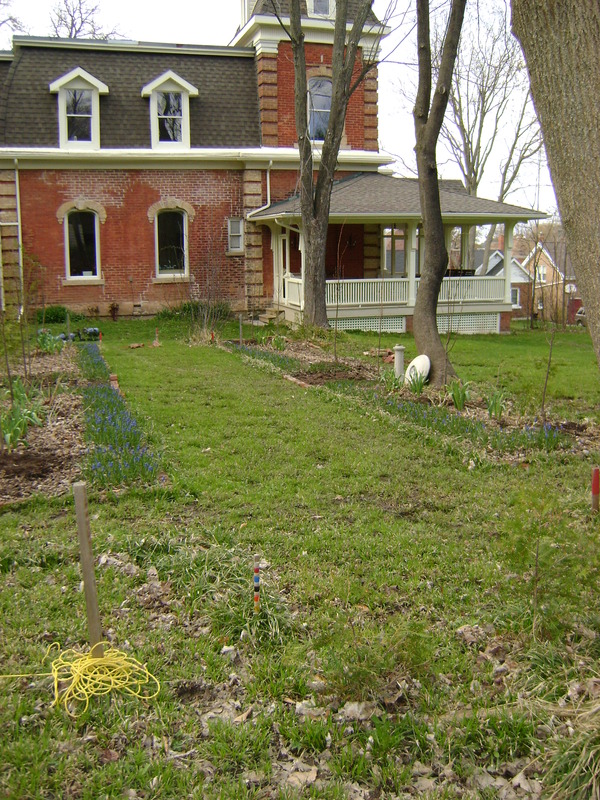 We found the house that we are in now, it has 3/4 of an acre so that will keep me gardening for a good long time. Blue Mountain is 40 min away and the Owen Sound yacht club is 10 minutes, so that will keep Ian busy for a good long time. So we bought it in 2006 and have been very happy with it so far. (I had to go back and read the beginning of this post, I couldn’t remember why I had started it). I had been sending out so many e-mails to the friends that we have all over and it got to be very time consuming. When a friend of mine (Hi Kelly), started her own blog, I thought that might work. I can write 1 post with pictures, and my friends could read it, at their convenience. Then, it started. There is blog statistics on WordPress. I just couldn’t resist looking at it. When it got up to over 15 hits, I figured out that it was just not my friends. Then I started checking it everyday, just to see how many more people had looked at my shabby work. When I started reading other peoples blogs about how to increase traffic to your blog, then I knew that I had a problem. Now, tell me, how do I get off this merry go round?